OXFORD, Miss. – Graham Bodie believes that if people can feel that they’re being heard during times of stress, their lives will improve. With that in mind, he is working to find the best way to teach critical listening skills that could enhance lives. 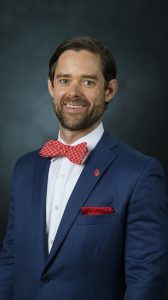 A visiting professor of integrated marketing communications at the University of Mississippi, Bodie is conducting his research through a three year-grant from the National Science Foundation. UM received the grant from the NSF’s Division of Behavioral and Cognitive Sciences as part of a collaborative effort to study what happens during conversations about everyday problems. Penn State University and the University of Minnesota also were awarded grants in support of the collaboration, which seeks to clarify how discussing everyday stressors with others conveys support and leads to different emotional outcomes. Bodie’s work will look at how a listener’s supportive comments influence the way a person talks about their stressful experience. “My academic background is in how humans process information and how they behave as listeners, particularly within the context of talking about stressful events,” Bodie said. “What do we say that allows others to better understand their unique stressors and ultimately to cope with those events? Bodie previously conducted research on listening and the social cognitive foundation of human communicative behavior. This project will expand on the nuances of what people do when they offer support to others, a facet that he said has not been thoroughly explored. This grant will allow Bodie to work with data from four previous studies, which includes more than 450 videotaped conversations of a person describing a stressor to another, while the listener provides support. The research conducted with this grant fits in with the university’s Community Wellbeing Flagship Constellation research initiative, where researchers identify factors that impair the well-being of individuals and work to implement programs to build stronger, more vibrant communities. The research will examine how variations in these particular types of interactions result in differences in how the distressed person continues to express their thoughts and feelings throughout the interaction. The investigators will analyze every element of these conversations and develop strategies to show how emotion and cognitive processing are affected during the course of an interaction. The researchers have predicted that distressed individuals who are responsive to high-quality supportive messages during an interaction leave the conversation with an improved emotional state and a new understanding of their issue. The researchers hope their findings will ultimately be able to assist support providers and counselors, while also leading to additional research to determine why some individuals or relationships show different levels of responsiveness during supportive conversations. “The novelty in this research is mapping responsiveness within interactions onto important conversational outcomes, which opens the door to new questions about why those patterns differ between people and between relationships,” Solomon said. Other investigators on the project include Susanne Jones, associate professor of communication studies at the University of Minnesota, and Nilam Ram, professor of human development, family studies and psychology at Penn State. Funding for this research was provided through grant no. 1749474 from the NSF Division of Behavioral and Cognitive Sciences.